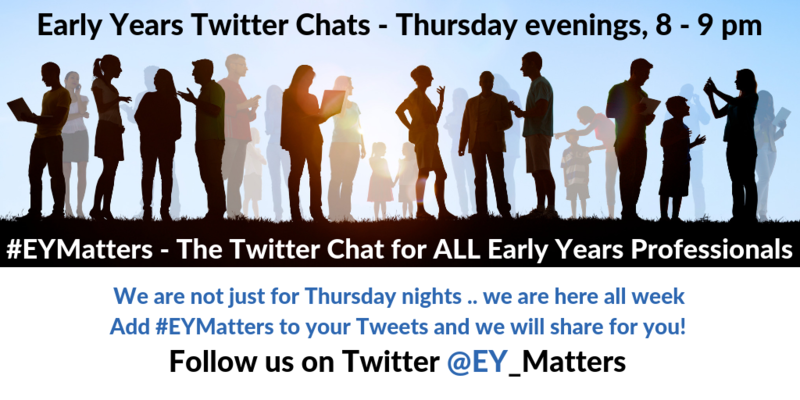 EY Matters for all Early Years Professionals. The purpose and aim of EY Matters is to support Early Years Professionals to Connect, Communicate, Collaborate and Create for the good of the sector. We are looking to support and promote quality and Continuous Professional Development whatever your role in the sector - i.e. trainer, consultant, teacher, nursery owner, childminder or practitioner - YOU ALL MATTER! Sector News and Articles: Bringing you the latest news, articles and blogs including updates in legislation and practice from Ofsted and Department of Education. Events and Training: Providing you with a small selection of conferences, events, training and webinars from our Events Calendar. You also have the option after signing up to select your region to tailor what we send you. Opportunities, Tenders and Jobs: We search the web to bring you information on open opportunities and can support you to form collaborations to tender for the larger opportunities. Press Releases (Ad-hoc): We will endeavour to bring you important breaking news items that affect the sector as it happens including industry reports and surveys. Join us on Thursday nights between 8 - 9 pm for our weekly Twitter Chats. Providing all Early Years Professionals a chance to debate, discuss and share information over a wide range of subjects that affect the sector. While away over Easter holiday, I met with a fellow early years campaigner to discuss current early years situation - and my personal situation and frustration at my limits . Our aim is to bring people together - to support each other, communicate with each other and to collaborate, working together to build individual and joint successes, to improve quality and standards. Join our conversations and read through the opportunities that we send out in our newsletters and publish on this site - let us know what you want to do and we will do our best to support you. United and working together - the sky is the limit to what we can create - improving the quality for the sector and for each and every individual child. I’ve waited a LONG time to find a like minded person, like Juliette, who has really taken the time to go the extra mile & drill down to understand my business, my vision & my goals for making a difference in the world. She has worked tirelessly to support me & she has enormous creative energy that I find inspiring, as we bounce ideas around together. She works with enormous enthusiasm, using her initiative & extensive expertise to lift the burden of tasks that allow me to create, write & stay focused on my areas of expertise & passion. I really enjoy collaborating, creating & working with her & I can’t recommend her highly enough. She is wonderful at connecting others & believes passionately in the Early Years. Give her a call ! It has been a real pleasure working with Juls. Juls has gained a professional insight into the sector and continues to raise the profile of Early Years through connecting and supporting Early Years Trainers and Consultants. Her support to me personally has been invaluable, she has knowledge and understanding in a wide range of skills that ensures we work smarter not harder! I have had the absolute pleasure of working alongside Juls on a number of occasions both in person and through online work. Juls is a genuine, kind and hardworking person - always willing to go above and beyond to make things happen and get things done. She is dedicated and committed to going that extra mile to drive things forward and is proactive in her approach, with contributions, ideas, and her ability to problem solve and provide solutions. Juliette was Operations and Membership Director for NEyTCO Community Interest Company from June 2017 to October 2018 and it is in this role that I have the pleasure of knowing Juliette. Her dedication, work ethic, communication skills, code of personal and professional conduct, and her immense abilities, earned my greatest respect and admiration. Juliette is a great networker and connector of professionals in the Early Childhood Education & Care (ECEC) Sector. She thrives on collaboration and the sharing of ideas She is focussed, professional, capable, and she has a huge heart for children and families as well as all those working in Early Years. Her nature and personality are very compassionate. Juliette uses her considerable talents to support Early Years Professionals. She is a great supporter of new ideas and campaigns to improve the life chances of children and to raise the quality of the ECEC sector. Determined, focused, knowledgeable and versatile. Always ready for any challenge. It was a pleasure working with Juliette and I wish her every success as she launches her new business. Juliette guided me through the process of becoming an Early Years consultant and from day one supported me every step of the way. Her words of advice and continuous encouragement got me to where I am today. She added an extra sparkle to NEyTCO and her attention to detail with paperwork requirements has been of outstanding value to me. Meeting Juls and starting to work with her has been an inspiration for me. From our first meeting it was clear that we got along. I find that the way she sees thing is refreshing – she can see what needs to be done, and sets to it. She’s very professional and has a vision of how to get things done. Juls puts ideas into action. Her work on my publicity has been brilliant, watching her translate my thinking into a website is fascinating. Her belief in, and promotion of, me has gained me new clients and recommendations, and given me a new professional circle to interact with. I am really looking forward to what our joint future holds.